Fast, sensitive, portable and disposable infectious detection techniques are essential to prevent and control of future epidemics. We are developing point-of-care nanophotonic diagnostic technologies for early detection of Ebola, Zika, Dengue and HIV infections. Our ultrasensitive label-free detection technologies are opening door to development of diagnostic tests with PCR level sensitivities while offering revolutionary capabilities for disease diagnostics in resource limited settings. The Achilles heel of systems biology is its reliance on average responses of large cell populations. This approach overlooks the critical subpopulations of cells. It is, however, becoming increasingly apparent that rare cell events are central to many physiological processes. 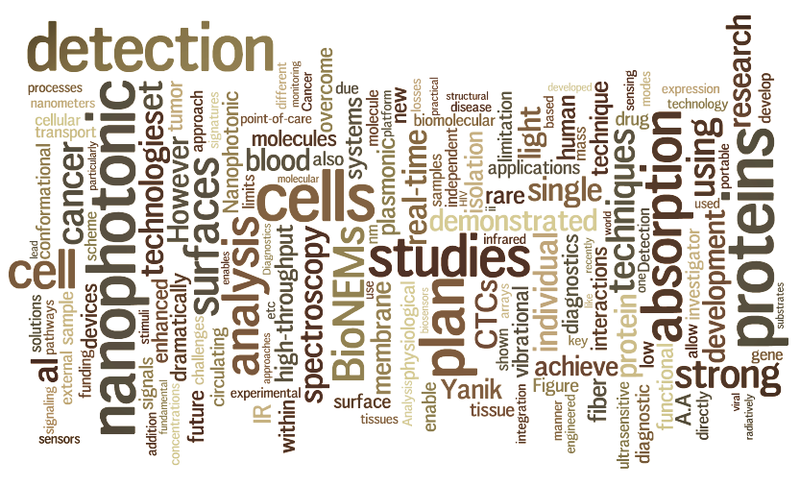 We develop real-time high-throughput BioNEMS technologies for single cell screening and comprehensive analysis of cellular heterogeneity. Instead of using large populations of cells to statistically measure one set of parameters (e.g. gene expression or secreted proteins), we extract multi-parametric information from rare single cells in a non-destructive manner, map cell lineages, functions, and genotypes in a high-throughput manner. The ability to slow down, confine, and manipulate photons at sub-wavelength dimensions has the potential to reinvent most of the known optical phenomena. Almost all of the photonic technologies and applications involve some form of light-matter interactions. Nanophotonic and plasmonic devices enhancing light-matter interaction by orders of magnitude in strength while enabling longer interaction times by slowing down the photons are key to future breakthroughs in nano-biophotonics and light harvesting applications. Union of phononic engineering and microfluidics could open door to previously unimaginable ways of tailoring surface acoustic waves and radiation forces for biomedical applications. We are developing phononic metamaterials and micro-electromechanical systems, offering unprecedented capabilities for manipulating and sorting of rare cells, bacteria and exosomes in microfluidic channels. Our goal is to introduce a new class of monolithic, compact, versatile and programmable lab-on-chip technologies with novel functionalities. In synergy with its research efforts, UCSC NanoEngineering Group is strongly committed to training of highly skilled researchers, recruitment of next generation of scientists to STEM fields and engaging our broader community. Some of the most pressing challenges of today's integrated world are emerging diseases, and development of sustainable materials and renewable energy resources. UCSC NanoEngineering Group aims to invent on-chip devices to help addressing these global challenges. We focus on development of photonic, electronic and phononic metamaterials, and their innovative uses in BioNEMS and energy harvesting applications. From the very conception, our efforts are tailored for realization of practical low-cost technologies for real world applications.